Thursday, January 19, 2012, 5:30 p.m. – 7:30 p.m. If you are in upstate New York, stop by Corning. I’ll be blowing glass and burning paper, and there will be wine and music and all the wonderful things to see at the Corning Museum of Glass. Anne Gant, is one of the few glass artists to work on paper. 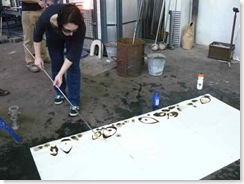 Watch as she uses hot glass to make prints and drawings in a fascinating combination of glassblowing and printing or drawing with glass. First, she sculpts hot glass into shapes and lines. While the glass is still scorching hot from the glory hole, she presses the glass forms into wet sheets of high quality rag paper. Instantly, the glass begins to burn and smoke the paper. In this dramatic process, the glass becomes cracked, scarred and destroyed and all that remains is its mark on the paper. There are bands for which rock and roll is a lifestyle, and then there are bands for which it is life. The Weber Brothers, who have shared the stage with icons like Garth Hudson, Levon Helm, Leon Russell, Derek Trucks and Kris Kristofferson, fuses stomping country rock with the brothers’ own love of pop music in all its splendor. Sip away the cold with tastings from over 20 Finger Lakes wineries.